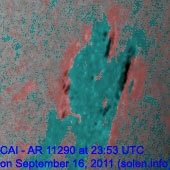 Last major update issued on September 18, 2011 at 06:35 UTC. 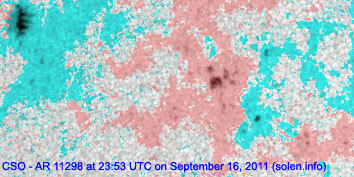 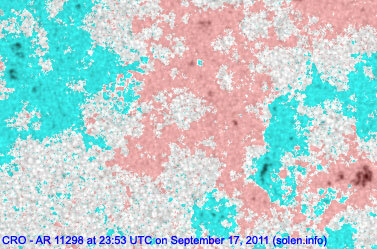 The geomagnetic field was quiet to major storm on September 17. 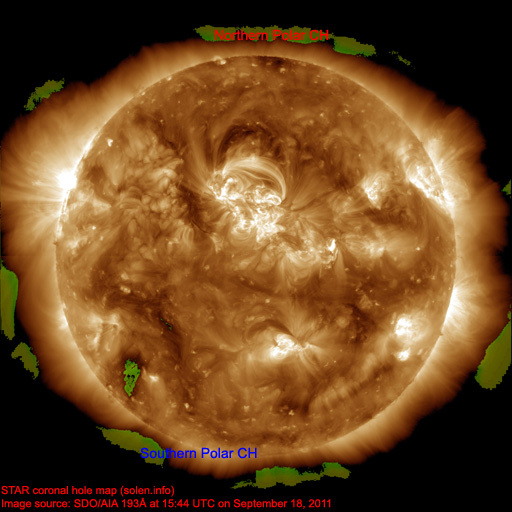 Solar wind speed ranged between 346 and 535 km/s. 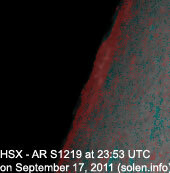 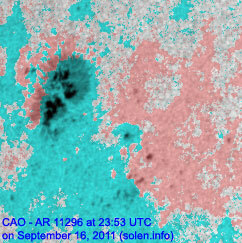 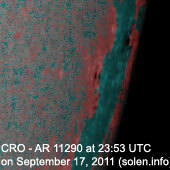 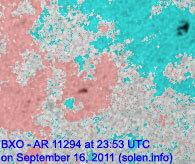 A solar wind shock was observed at SOHO at 03:05, the arrival of the CME observed on Sept.13/14. 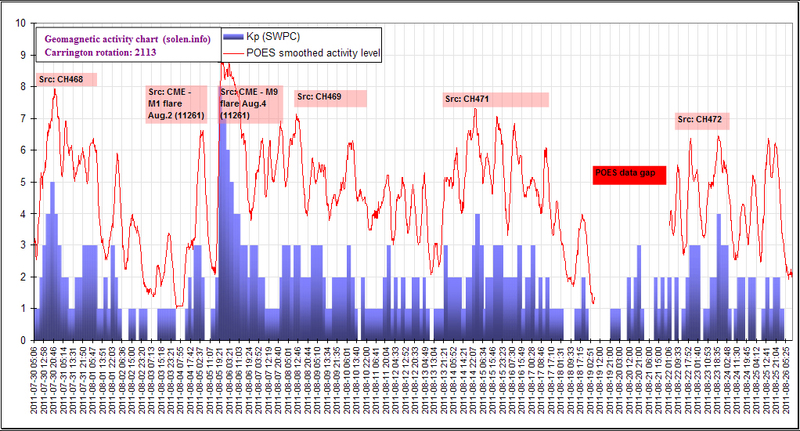 After the shock the interplanetary magnetic field was at times moderate to strongly southwards causing major geomagnetic storming. 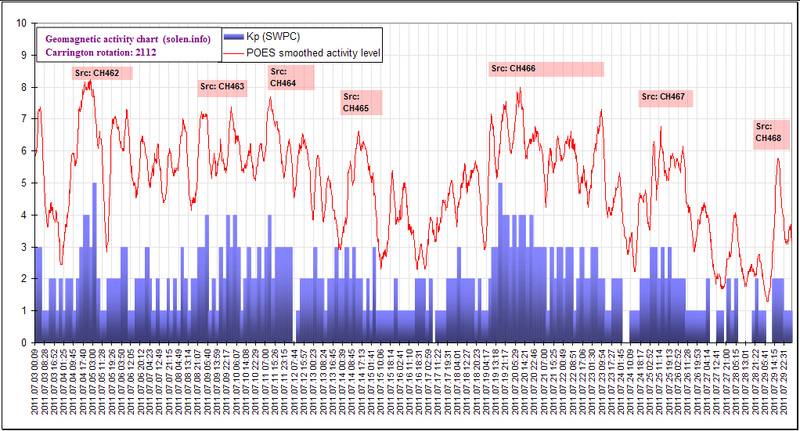 The peak of the storm was during the 14-17h UTC interval when the 3-hour ap index reached 111. 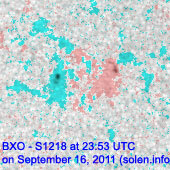 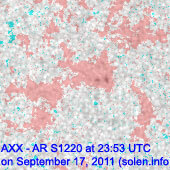 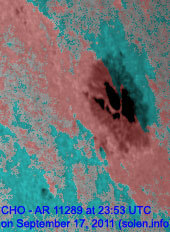 Solar flux measured at 20h UTC on 2.8 GHz was 144.8 (increasing 43.9 over the last solar rotation). 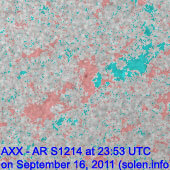 The planetary A index was 32 (STAR Ap - based on the mean of three hour interval ap indices: 32.4). 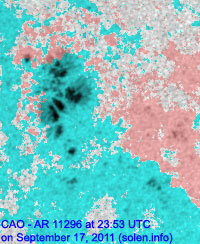 Three hour interval K indices: 03346643 (planetary), 13444532 (Boulder). 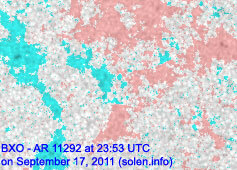 Region 11289 [N23W65] was mostly unchanged and quiet. 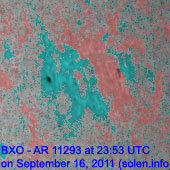 Region 11290 [S11W81] decayed slowly and was mostly quiet. 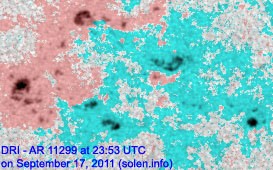 Region 11292 [N09W15] decayed slowly and quietly. 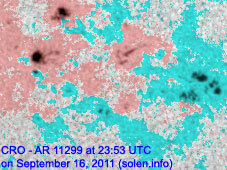 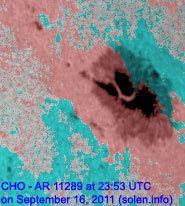 Region 11294 [S18W38] decayed slowly and could become spotless today. 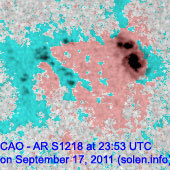 Region 11295 [N22E05] was mostly quiet but has the potential to produce C and M class flares. 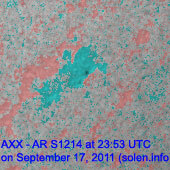 Region 11296 [N27E22] decayed slowly and quietly. 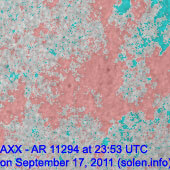 Region 11298 [N15E09] decayed slowly and quietly. 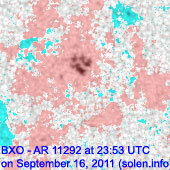 Region 11299 [S19E12] developed slowly and quietly. 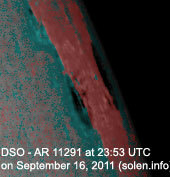 September 15-17: No obviously Earth directed CMEs observed. 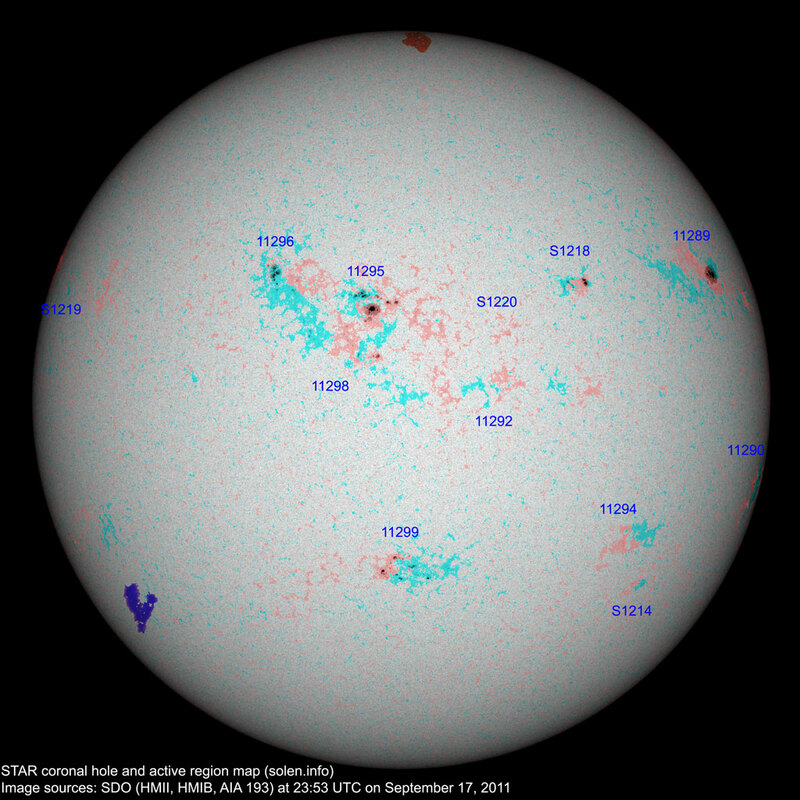 The geomagnetic field is expected to be quiet on September 18-20 with a chance of unsettled intervals on Sept.18.